Place a medium pot over medium-high heat and coat the bottom of the pot with low sodium vegetable broth. When broth is boiling add onion and stir. Cook for 5 minutes, stirring frequently. Lower heat to medium. Add garlic and ginger. Cook until onions are translucent, stirring frequently and adding more broth if necessary to prevent burning. Add chili powder, cumin, paprika and cinnamon. Stir. Add undrained black beans and stir. Mash with the back of a fork or a potato masher, leaving some of the beans whole. Add kale and stir. Lower heat to low and let simmer until mixture thickens. Stir in lime or lemon juice and hot sauce and salt (optional) to taste. Cover until ready to serve. Recipe from Healthy Girls Kitchen. What a yummy dish, so comforting and hearty! What are those next to the rice- plantains? 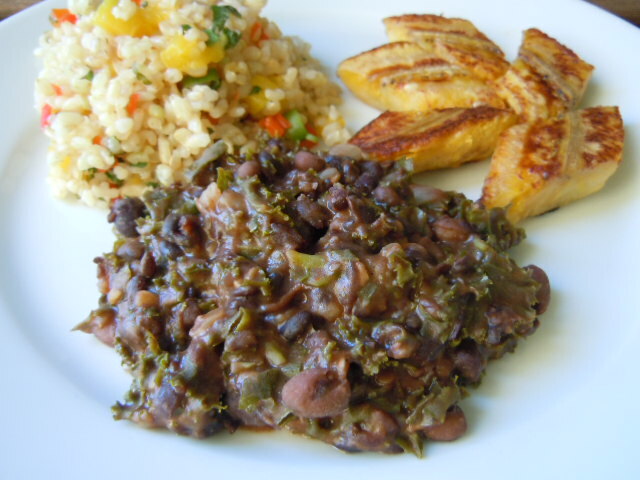 I love Cuban Black Beans, and I have never cooked them with kale before, but I assume they provide a bit of greens. Right now in Spain, I am simmering these soaked dried alubia beans (they are Spanish white beans, massive, and a size of a quarter). This is my first time to try these, and a bag of these wonderful beans was left in the pantry by a previous tenant so I have decided to try them. It’s still cooking, for 2 hours already. Hopefully they turn out tender and ready for a simple pasta dish with tomatoes, olive oil and spices. I can’t find any kale in Spain, it’s so odd, but I do miss kale and the usual Farmers Markets in Oregon. My daughter lived in Madrid for one year attending the University. There were so many foods that she missed while living there. I was sending her care packages of some of her favorite shelf stable items like peanut butter, pancake mix and real maple syrup. I came up with a few vegetarian recipes for her to use in order to stretch her food budget. When she came back home she left a lot of groceries in her apartment kitchen – just like the previous renter in yours! Where in Spain are you living?